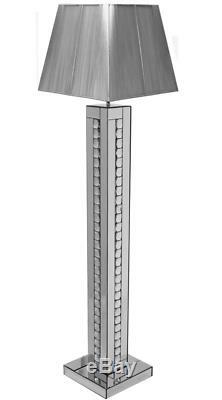 Mirrored Crystals floor lamp with square grey Shade. A reflective Floor lamp with architectural exterior and the beacon of modernity that catches the pragmatic temperament of contemporary craftsmanship outlines. This well-designed table lamp is made of Silver mirror base, decorated with crystals and is complemented with a sumptuous Silver string shade. A true statement piece to accentuate any space. Dimensions : Lamp Body: 30.5x 30.5x 142 cm Shade: 45x45x33 cm. Bulb Used:E14 Max 60W (NOT INCLUDED). Lamp Body : Individually packed in Brown box. Lamp body and shades packed separately. Dal's Interiors is an internet only based company. Our business is well established supported by vast years of experience in the furniture industry. We pride ourselves in customer service and the quality of our products. Our range is procured from leading UK based Manufactures at competitive prices which allows us to pass on substantial savings onto our customers. We will do our best to provide first class service to all our customers. All costs specified are for UK Mainland only. Zone 2: Highlands and Islands of Scotland. HS1, HS2, HS3, HS3, HS4, HS5, HS6, HS7, HS8, HS9, IV1, IV2, IV3, IV10, IV11, IV12, IV13, IV14, IV15, IV16, IV17, IV18, IV19, IV20, IV21, IV22, IV23, IV24, IV25, IV26, IV27, IV28, IV29, IV30, IV31, IV32, IV36, IV40, IV41, IV42, IV43, IV44, IV46, IV47, IV48, IV49, IV51, IV52, IV53, IV54, IV55, IV56, KA27, KA28, KW1, KW2, KW3, KW5, KW6, KW7, KW8, KW9, KW10, KW11, KW12, KW13, KW14, KW15, KW16, KW17, PA20, PA21, PA22, PA23, PA24, PA25, PA26, PA27, PA28, PA29, PA30, PA31, PA32, PA33, PA34, PA35, PA36, PA37, PA38, PA39, PA40, PA41, PA42, PA43, PA44, PA45, PA46, PA47, PA48, PA49, PA60, PA61, PA62, PA63, PA64, PA65, PA67, PA68, PA69, PA70, PA71, PA72, PA73, PA74, PA75, PA76, PA77, PA78, PH17, PH18, PH19, PH20, PH21, PH22, PH23, PH24, PH25, PH26, PH27, PH28, PH29, PH30, PH31, PH32, PH33, PH34, PH35, PH36, PH37, PH38, PH39, PH40, PH41, PH42, PH43, PH44, PH49, PH50, ZE1, ZE2, ZE3. Zone 3: Northern Ireland, Isle of Man & Isles of Scilly BT1, BT2, BT3, BT4, BT5, BT6, BT7, BT8, BT9, BT10, BT11, BT12, BT13, BT14, BT15, BT16, BT17, BT18, BT19, BT20, BT21, BT22, BT23, BT24, BT25, BT26, BT27, BT28, BT29, BT30, BT31, BT32, BT33, BT34, BT35, BT36, BT37, BT38, BT39, BT40, BT41, BT42, BT43, BT44, BT45, BT46, BT47, BT48, BT49, BT51, BT52, BT53, BT54, BT55, BT56, BT57, BT60, BT61, BT62, BT63, BT64, BT65, BT66, BT67, BT68, BT69, BT70, BT71, BT74, BT75, BT76, BT77, BT78, BT79, BT80, BT81, BT82, BT92, BT93, BT94, BT99, IM1, IM2, IM3, IM4, IM5, IM6, IM7, IM8, IM9, IM99, TR21, TR22, TR23, TR24, TR25. Scottish mainland: AB30, 33-36, 42 to 45, 53 to 56, DD8-9 IV21 to IV24, IV26 to IV28, IV40, IV52-IV54. KW1 to KW14, PA36, PA40, PH30 to PH43. AB41 , FK19 to FK21, IV1 to Iv20, Iv25, IV30 to IV37, IV63. Pa21 to PA35, PA37 to PA39, PH15 to PH26, PH49 to PH50. PLEASE NOTE ANY ORDERS PLACED AFTER. AS WAREHOUSE WILL BE CLOSED. The item "Mirrored glass Sparkly crystals floor lamp with square Silver Shade 175cm/ Home" is in sale since Wednesday, June 28, 2017. This item is in the category "Home, Furniture & DIY\Lighting\Lamps".